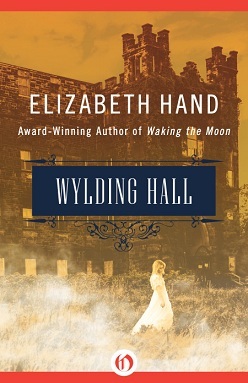 Wylding Hall by Elizabeth Hand is told in the format of the oral history of the creation of a seminal record. In the summer of 1972, the young members of folk-rock band Windollow Faire are sent by their manager to a remote old English manor house to record their sophomore album. The band has recently gone through a tragedy — the death of one of their own — and their summer at Wylding Hall is also a chance to escape the photographers and journalists. In fact, their manager Tom asks that they see no family or friends either — their summer at the hall should be about music and music alone. Wylding Hall, the album they record that summer, becomes a quiet cult hit whose influence grows over the decades. Now, in the present day, the members of Windollow Faire and some of the people who knew them then look back at that summer and its eerie events. What gave rise to their unique music? What happened — and didn’t happen — at the hall? What secrets does the old manor house keep? And most of all, what happened to lead singer Julian Blake, who was never seen again? The chances I wouldn’t enjoy a story by one of my favourite writers that combines music, an eerie old house and English folklore were slim; I’m sure it will surprise exactly no one to hear that Wylding Hall didn’t disappoint me in the least. I’m glad I read it now because I was craving a good haunting read, but part of me wishes I’d saved it until October, as it would make a perfect pre-Halloween book. Wylding Hall is a triumph of atmosphere. That’s not all it is, but I don’t want to minimise this aspect of it because it’s not easy to get the tone of a book like this as precisely right as Elizabeth Hand does here. The blend of traditional folklore and pop culture is seamless too, which will not surprise readers of her work. And I will also say, as a reader who doesn’t get scared all that easily, that I found certain parts of it absolutely terrifying, though it’s possible that you need to share my dead bird phobia to be as disturbed as I was. (Dear Memory: consider this fair warning.) Wylding Hall sets out to create an atmosphere of subtle horror and wrongness and it absolutely succeeds. And yet, in the tradition of the folklore it draws from, the spookiness of Wylding Hall is accompanied by a sense of awe and possibility that draws readers in at the same time as it warns us away. The same is, of course, just as true of the characters. Another thing this novella does very well is capture that perfect chemistry that happens when people come together artistically in ways that surpass even their highest expectations, and then go on to create what they can tell is remarkable work. This was something I really appreciated about the theatre production storyline in Hand’s wonderful Illyria, and she gets it right again here. Wylding Hall is about music and art and the sense of possibility you experience when you’re young and on the verge of something big, and endless doors seem to be opening before you. It’s also about old lore, and ancient traditions like Wren Day, and being drawn to something you know you should probably turn away from. Julian Blake, the missing Windollow Faire singer, is both at the centre of the story and not. I loved the multiple perspectives, and I loved how the story is structured in a way that explores how the events of that summer affected each of the people involved, no matter how peripherally. Truth is, often Lesley got the fuzzy end of the lollypop. Didn’t get enough credit for the songs she wrote or the arrangements she came up with, didn’t get credit for how much of our live performance she carried. Especially when Julian was around. He overshadowed everyone. Later, she was the one became a big star. The rest of us might have been forgotten if it wasn’t for Wylding Hall. But we never took Lesley seriously enough. There was something to Wyding Hall that made me think of this recent piece on the gendering of martyrdom, and how we tell very different stories about promising women or promising men who die young. This is a story that can (and indeed should) be enjoyed as a eerie folklore-inspired fantasy, but I liked that there was another side to it too, and I enjoyed going over the questions it invites us to ask. They read it too: Reading the End, you? Somehow I hadn't heard of that Ellis Peters and now I want it desperately! Hooray, I am so pleased you liked it! Though as you say, chances of your not liking it were slim. I didn't even think about the element you highlight, that Hand portrays so successfully the coming together of disparate creative elements, but that IS a wonderful aspect of this book. The descriptions of the band's music together reminded me (now that you've brought it up!) of my favorite-ever making-music scene -- predictably it's the scene in Fire and Hemlock where Polly's watching the string quartet play. Aww, that's such a great scene. PS: I love it when you remind me of Fire and Hemlock or Gaudy Night. IT'S THE BEST. THIS SOUNDS AMAZING. I've slowly been circling seventies rock, and this sounds perfect. This sounds wonderful, and a perfect read for Autumn. Absolutely! I think I'll have to pick up another Elizabeth Hand in September/October. She's so great at atmosphere. So, I read your review... Went on Scribd and the book was on there... And read it this afternoon! Good stuff and my first Elizabeth Hand. Okay, this is definitely near the top of my Gotta Read It list now, but perhaps I'll wait until October to maximize the creepiness (and, hopefully, to give me time to brace myself for all the dead bird stuff).